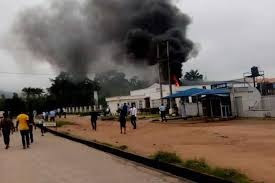 A fire outbreak on Monday occurred at the branch of the Access Bank Plc on the campus of the Adekunle Ajasin University Akungba Akoko, Ondo State. The fire, which started in the earlier hours on Monday was said to have destroyed some offices and the section of the Automated Teller Machine of the bank. It was also gathered that an undisclosed amount of money kept inside the ATMs was destroyed in the inferno. The cause of the fire was unknown as of the time of filing this report but a source said the cause of the fire could be connected to power surge. An eyewitness explained that it took the quick response of the university’s fire service for the fire to be put off, noting none of the bank’s workers had resumed work for the day when the fire started. The eyewitness said, “The fire incident affected the four new ATMs that were just installed at the bank and also some offices were burnt down by the fire. In his reaction, the Head of Media and Public Relations Unit of the institution, Mr. Sola Imoru, who confirmed the incident, told our correspondent on the telephone that the fire did not have any impact on the school and the university community.